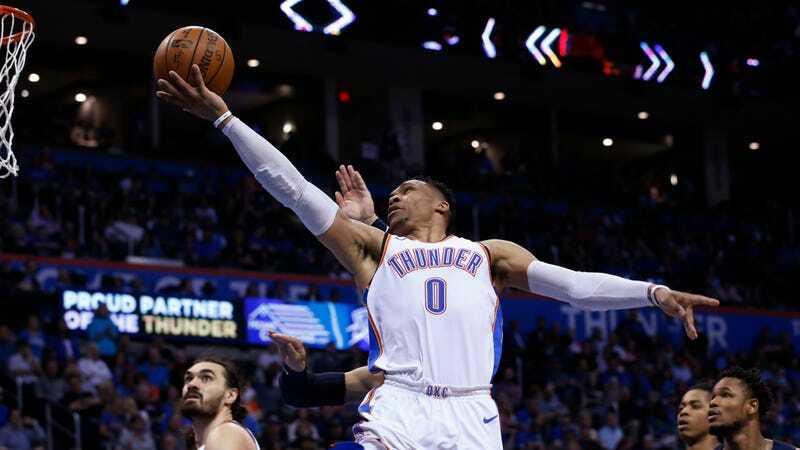 Oklahoma City TV announcer Brian Davis has been suspended by the team for Game 1 of the Thunder’s first-round series against the Jazz after he used the phrase, “out of his cotton-pickin’ mind” to describe Russell Westbrook in the team’s final regular-season game. The Thunder’s radio announcer Matt Pinto will take over TV duty for the game while Davis is out. Davis reportedly met with players on Friday, and he released a statement apologizing for his choice of a phrase with racist connotations. Apparently Mahoney changed his mind, or someone else decided Davis needed some sort of consequence. Correction (10:56 a.m. Saturday): This article originally misstated that Dan Mahoney was the “VP of Officiating.” He is the VP of Broadcasting. Thunder Call Out Announcer For Saying Russell Westbrook Was "Out Of His Cotton-Pickin&apos; Mind"